FLOWER CRAFT: This is a pattern for making a large flower. It is designed so that your kids can add their OWN ideas and creativity to personalize it. 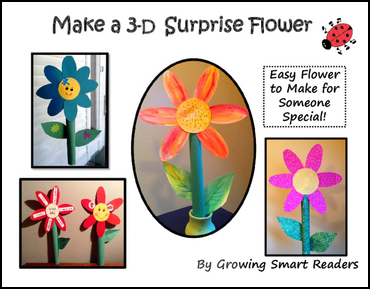 For a special Thank You, Mother's Day, Grandparents' Day, a birthday surprise, or simply create these for decorating the classroom! This is of my most popular freebies--probably because it is one of the easiest and simplest crafts to make, yet EVERY child feels successful when it's completed! The flower pattern is intended to be simple enough and basic enough so that kids use their own creativity. Let your kids be creative! Individual creativity and personalizing is up to your kiddos! There's room for them to improvise or add little extras. You may want to suggest adding stickers, glitter, stamping or gluing on colorful foam insects! You may even want to cut and curl the petals, for example! Trace the patterns on scrapbooking papers! Or even try tempera painted or textured papers that you have collected to use as flower parts. You can modify this pattern so it suits your age range. The directions (and patterns) are for children who can read and follow directions at a third grade level. For third graders, the direction page can serve as a procedure reading. Another idea is to have them create their flower and write their OWN procedure for creating a flower. For younger children, the directions should be read by the teacher or parent. 1. Use the black and white outline patterns to copy onto sturdy paper your choice to make tracing templates. This paper could be ANY scrapbook papers, painted, or textured papers that you or the kids have collected.This way you are encouraging fine motor skills with a pencil AND cutting...if you have fancy papers, it's even more fun. 2. OR: Copy the petal pattern directly on colored construction paper--so kids can just cut out the petals. I've included separate pages for just petals so you can make lots of them in one color. Remember to put in the surprise! The surprise is in the flower...a poem or special note. An optional stationery page is included for a note. Kids create a large flower with a special, handwritten note rolled up inside the stem (optional).They love the size of it when it's all finished. For those just learning to write, their letter could be a picture of themselves (the sender) with "I love you!" (to the recipient). Say "Thank you", "Get well", "Happy Mother's Day", or a loving gift for Grandparents' Day. It's another way to say Happy Birthday", "Happy Valentine's Day", or "Happy Spring", too! Your child(ren) can give this away as a creative alternative to a regular card. When they stand up on a window sill, they are extra cute, and you have an instant garden! But I think the flower looks striking in a vase, too! It's amazing how one flower can be just as wonderful as a whole bouquet! -Adjective words that can be cut out and pasted onto the petals. My kids enjoyed making this...I hope yours do, too! Have fun growing smart readers in your classroom! Please note: For single classroom use only. Although this is a free product, it may NOT be shared on the internet, repackaged, resold, or redistributed in part or whole. Google accesses your link if you post it on your classroom website, making a direct download to everyone. This store link is the only one that should be used.Thank you very much for following these terms.This is an original pattern created and copyrighted by me, at Growing Smart Readers © 2013.